MONTICELLO, NY (May 5, 2014) – To celebrate Earth Day back on April 22, the 3rd and 4th grade students of the George L. Cooke participated in a “Pick your pledge and do you part!” contest, which was sponsored by “The Catskill Shopper.” The pledge involved something the student were willing to do to help Mother Earth. Honorable Mention winners were 3rd grader Iysis Drayton in Lauren Siegel’s class, and Kimberly Thompson’s 4th grader David Abreu for Honorable Essay. 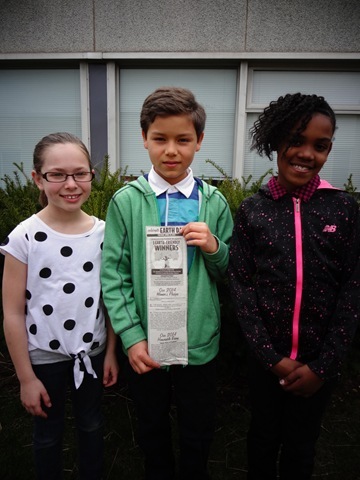 The two winners of the “Earth Day Contest” were Luiz Bibaj from Elyssa Olsen’s 4th grade class and Amalia Decker from Lauren Siegel’s 3rd grade class. The two winners each won a tree or a shrub from one of the sponsors: Delaware Valley Farm & Garden, Liberty Agway Home, Garden & Pet Inc., and Monticello Farm Home & Garden. These trees or shrubs will be planted to beautify the George L. Cooke Elementary School grounds. EPIC Coordinator Jane Sorensen was the promoter behind the contest.